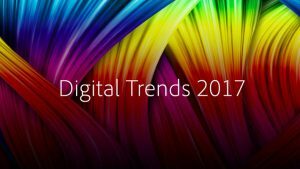 The 2017 Digital Intelligence Briefing just released by Adobe and Econsultancy provides a wide perspective on digital and marketing trends. A record-breaking 14,000 marketers and agencies around the world shared their thoughts and opinions. This year, marketers continue to make customer experience a top priority and this report shows that the pace of digital transformation is picking up once again. Over one-fifth (22%) of client-side respondents ranked optimising the customer experience as the single most exciting opportunity for the year ahead, putting it ahead of creating compelling content for digital experiences, which was chosen by 16%. The continued push toward customer experience is reflected in areas that marketers chose as their priorities for the year: content marketing (chosen by 29%), social media engagement (28%) and targeting and personalisation (25%). However, the responses also uncovered some disconnects between the perceived opportunities and the means to achieve them. While “optimising the customer experience” ranks as the single most exciting opportunity, data-driven marketing lags behind with only 12% citing this area as an opportunity. Marketers must have the right data to get great customer experience, and they cannot afford to overlook the need to invest in capable data analytics. Many marketers consider design to be a crucial advantage on the path to digital transformation, with 86% of survey respondents agreeing that design-driven companies outperform other businesses. This design-centric mindset is seen in the emphasis marketers place on creating personalised, relevant, and valuable customer experiences. However, our report also uncovers challenges yet to be navigated in this area. While 82% of survey respondents believe that creativity is highly valued within their organisations and 77% of them are investing in design to differentiate their brand, just over two-fifths (41%) of those surveyed don’t think that they have the processes and collaborative workflows to achieve a design advantage. In fact, 36% of client-side respondents say they have difficulty mastering well-designed user journeys that facilitate clear communication and a seamless transaction. A firm grip on culture, collaboration, skills, data, and technology is also vital for getting customer experience right. Client-side marketers recognise this. Almost two thirds (63%) consider improving data analysis capabilities to be “very important” for delivering a great customer experience, with 53% choosing optimising internal collaboration between creative and marketing teams, and the same amount selecting the importance of optimising internal workflows (53%). It is a great start to see a small majority (53%) of organisations recognising the importance of collaboration, however, collaboration between marketing and creative is only a start. To get great end-to-end customer experience, organisations will need to look beyond these two teams to break silos for the entire enterprise. These are just a few of the insights from the 2017 Adobe-Econsultancy Digital Intelligence Briefing. Read the full report today for a more detailed analysis, regional highlights, a look to 2020, and more.